Last week, thugs in the Iraqi port city of Basra kidnapped American journalist Steven Vincent and his translator, Nouraya Itais Wadi, then pumped them both full of bullets. 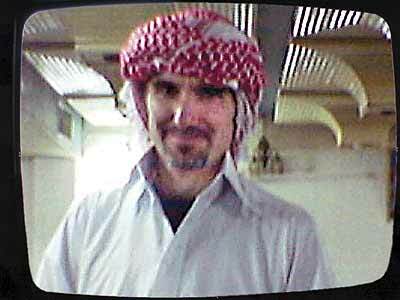 Wadi survived with multiple wounds; Vincent did not, the first American journalist kidnapped and killed in Iraq since the start of the war in March 2003. It’s possible the murderers were members of the Basra police force, which has been infiltrated by militiamen. They abducted Vincent and Wadi as they left a foreign-currency exchange. Five hours later, he was dead. Although I am also a journalist in Iraq, I didn’t know Vincent except by reputation and a number of near misses back when we were both members of the East Village freelance writers’ community. But we shared remarkably similar career paths. Both of us were political bloggers, and we witnessed the smashing of the World Trade Center from our respective apartments. We both left our freelance beats—his was art, mine technology—to become war correspondents in Iraq. And we both traipsed around the country unembedded for a while. Vincent and I would have disagreed on most things about Iraq and the wisdom of the American project here—except for the urgent need to check the rise of religious parties intent on turning back the clock a few centuries on the Iraqi people. This was a favorite topic of his—“Islamofascism,” he called it—and one over which I would have happily toasted a beer with him. But his writings likely angered the wrong gunsels, and they killed him for it. Medievalism scored a victory with his murder. Any reporter’s death hits close to home among the Western journo-tribe of Baghdad. Vincent often met with reporters visiting Basra; many of them were my colleagues and friends. So we’ve consoled ourselves by telling each other he was reckless—running around a conservative Shiite city with a female translator, not using security, and insulting militia strongmen on his blog and in his writings. Courting bad luck. Vincent’s actions are seen as a checklist of what not to do. We would never do such foolish things, we tell ourselves. And yet, I know that’s a rationalization. It’s the way we all speak when something terrible happens, the way we spoke when other reporters were kidnapped. It’s the only way to protect ourselves from the nagging fear that being a journalist in Iraq means risking death every day—that the line between bravery and bravado is a hazy one indeed. Things are very bad here. This was a week to pay attention to the war again—a week when editors gave the green lights once more to stories from the region. Vincent was murdered. NYPD cop James McNaughton was killed by sniper fire. And more than twenty Marines lost their lives in two days. For those of us who do not share his sense of moral clarity, that answer would be much murkier. Vincent was sure of the good intentions of his countrymen, even if he questioned some of the outcome. That surety can be a protection. I never signed on with the American Plan, and that lack of faith has left me naked before the paranoid cynicism that permeates Iraqi society—demoralized by the effort to sense hidden motives. Vincent’s passion for America’s project allowed him to keep caring deeply about the fate of Iraq, even after everything that has happened. And for that, I envy him.